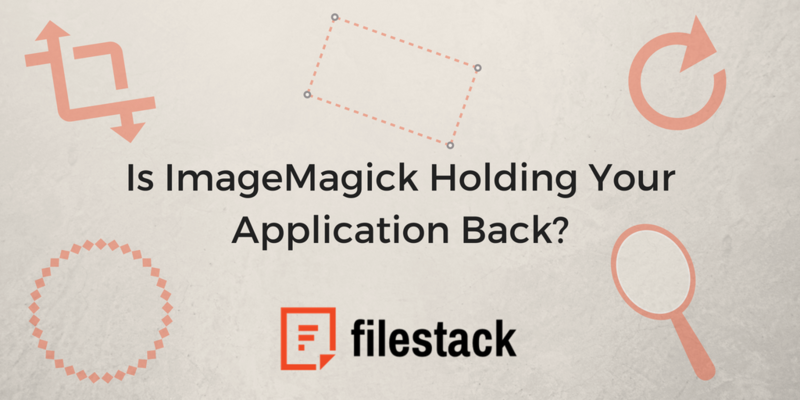 Is ImageMagick Holding Your Application Back? ImageMagick is a popular tool for transforming images, but it’s not your only option. When, in 2016, news broke of glaring vulnerabilities within ImageMagick, many developers escalated their search for an alternative to the imaging tool. We may be biased, but let us tell you why you should quit using ImageMagick in favor of Filestack. As a developer, you’re only as good as your tech. One of the main pain points with ImageMagick is the speed and maintenance involved with using the image transformation tool. There’s no way around it: When you use ImageMagick, you spend a lot of time from the get go just to build it into your website. If you are still using ImageMagick, it’s probably because the software has been around for nearly three decades (it might be older than you are). And while legacy is a good reason to give something a try, it’s not a reason to stick with it if it does not work for you. ImageMagick is free and open source. Those sound like selling points, but consider WordPress – the popular open source CMS. Just as you need to invest a lot of time and energy installing themes, updating the CSS, and making everything look professionally designed, the same holds true for ImageMagick. The image editing software is free to use, but when it doesn’t work as it should be, you looking at doing your own troubleshooting. It’s something of an open secret in the dev world that ImageMagick has a lot of bugs. Sure, you have your workarounds – but have you thought of how much time you are actually spending devoting time to maintenance? All the time you’re spending debugging things could be better spent enhancing your website if you dropped ImageMagick in favor of Filestack. There there’s the reputation problem. After that zero-day vulnerability incident, top companies (we’re talking Facebook and Yahoo) dumped the tool. Facebook even paid a $40K bounty to a developer who alerted them of the exploit. Security researchers caution that the zero-day vulnerability is one of many in the open-source software. If you’re the sort of developer who likes to be future ready, well…. you know what to do. Filestack is easy to install (seriously, you’re only two lines away from having all the functionality ImageMagick does) with none of the debugging, security flaws, and time wastes). Filestack allows for bulk image transformation, so you can get more done in less time. Yet you can also work slow, editing the settings for every image to have total control. It’s a flexible, modern solution. ImageMagick helps you out with transformations, but how else do you use it? When you integrate with Filestack, you will get much more than the simple image transformations you’re running with ImageMagick. Choosing Filestack opens the door for the best upload experience for your customers (FII, CIN), and internally (CDN, ContentIQ). By investing in Filestack, you become part of a much more robust program that improves your image transformation experience and more. With Filestack, you can add filters to blur or sharpen images, collage images, crop images, or rotate images. You can be as granular as you like with this work, tweaking all of the settings to reflect your needs, or create on scale with automatic settings. You can add a watermark to protect your intellectual property. There are also other borders and effects, including vignette, circle, torn edges, and rounded corners. URL screenshots are a popular feature, which allow you to capture the entire content of a webpage in screenshot format. Then there’s also image to ASCII conversion. Create html files from images using the Filestack transformation engine. After so much time fixing ImageMagick on your own, how does 24/7 maintenance from a dedicated support staff sound? Filestack has you covered with anytime help. Top companies from JibJab to Teachable trust Filestack to create professional graphics. Bottom line: ImageMagick is the past, and Filestack is the future. Are you ready to see how it all works for yourself? Play around with the transformations on the Filestack website, or request a free trial.